I couldn't help myself - one last deer photobomb. Can you spot her? In the lower right hand corner? It may help to click on the photo to make it larger. Our deer have been gone for several weeks now. The snow gets very deep here along the spine of the Keweenaw, so they migrate to areas along the Lake Superior shoreline to spend the rest of the winter where the snow isn't as deep. We refer to it as "yarding up." Those deer yards provide them with shelter, more protection from predators and food. Local clubs even participate in supplemental feeding programs to help these animals make it through our harsh winters. As soon as the snow melts enough in the spring, the girls will be back. Right now, we're missing our daily visits with these beautiful creatures. I love this verse, as it reminds me that the Lord knows me - everything about me. He knows my name, the number of hairs on my head, and He also knows my heart. 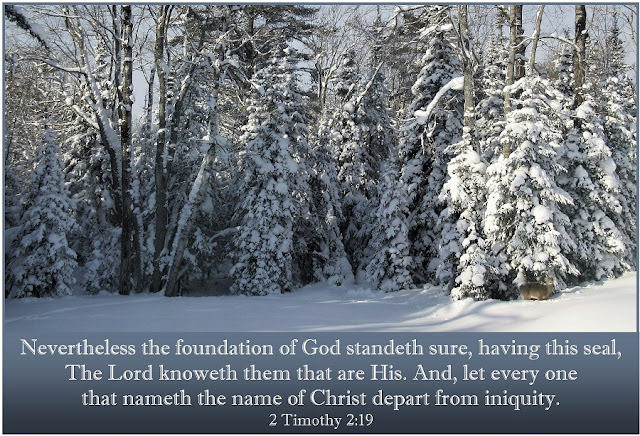 This verse then goes on to instruct me to depart from iniquity. Although I'll never be able to live a sinless life, it is surely my responsibility to strive to sin less and less as I live my days here on earth. Yarding up with fellow believers can certainly help me with that! That is a beautiful scenery photo, and the deer adds to it. Thanks for sharing the beautiful scripture along with your photo. Enjoyed seeing it. I probably would not have seen it if you had not pointed it out. Beautiful picture! Don't feel bad. I had no idea that deer was there when I snapped this photo of the view through our sliding doors. Yarding up! That phrase is going to stay with me. This is my favorite of your Sunday Reflections yet. Yep, we need to yard up with other believers - just like we do on Sundays through various blogs! Thanks for the positive comment, Jamie. In the Amplified Bible there's one scripture that is translated that we are fully known and fully understood by God. That is so meaningful and powerful to me. Meaningful - powerful - and humbling. Nothing is hid from Him. Thanks for that contribution, Elizabeth. I like that term...yarding up. I've used that term often since moving to the Keweenaw, but this week was the first time my mind related it to the life of believers. I'm thankful that God gave me that little nugget.